Published 2017 vasario 13 at 318 × 324 in Apie senojo Zodiako kilmę. From Bartholomeus Anglicus, De proprietatibus rerum (Lyons, 1485). By permission of the Huntington Library. 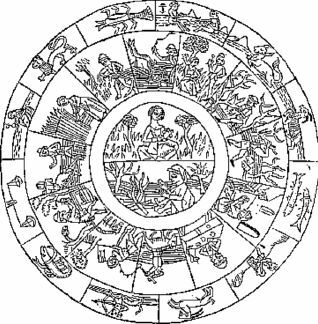 In this illustration of the signs of the zodiac, the various activities of the month are illustrated. In the centre are the two great principles, male and female; the female of summer, love and passion, the male of winter, thought and reason.